Whatever the musical source, what you hear at home will be largely dictated by the quality of loudspeakers you use. Skimping is not recommended. If you don’t have room for monolithic floorstanders (and frankly who does? ), you’ll want to consider bookshelf, or standmount, designs. These are generally large enough to incorporate drivers able to move air and excite with clarity and slam, yet small enough to park between your Alan Moore graphic novels and unread George RR Martin tomes. 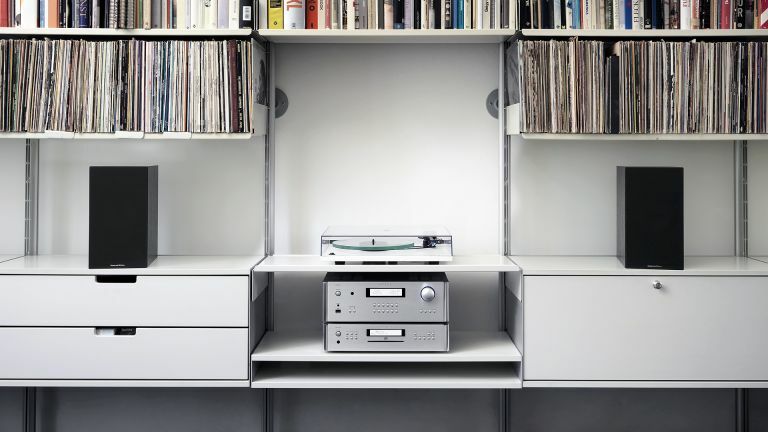 Alternatively they can be positioned on dedicated speaker stands (the performance of any bookshelf speaker will improve when located atop a dedicated stand) or wall mounted using bespoke brackets. Bookshelf standmount loudspeakers are ideally suited for smaller living rooms, bedrooms and dens, and can deliver a big sound from a relatively small cabinet. Unlike all-in-one multiroom speakers, like connected Sonos or Heos models, they also offer pronounced stereo imaging. The UK Hi-Fi industry has a long history of producing excellent small speakers, so there’s no shortage of models to choose from. Read on for our guide to the five best bookshelf speakers you can buy today. It’s a well known fact that everyone at some point in their lives will own a pair of Wharfedale Diamond loudspeakers. It’s just a question of when. Our recommended starting point are these bookshelf shiners. This best-selling addition to an enduringly popular line, these diamonds have a far from rough delivery. The 220 cabinet is made from layered MDF with a chipboard filling to help dampen resonance, finished with a vinyl wrap. While they’re unlikely to walk away with a Red Dot award for style, they look solid enough. You can choose from Blackwood, Walnut Pearl, Rosewood and White finishes. Doing most of the heavy lifting here is a 13cm woven Kevlar mid/bass driver, supported by a tweeter centered in a deep dish. A ported design, they should be positioned close to a boundary wall for the best possible bass response. This proximity adds weight to the mid-range and allows the 220s to rock harder. Partner them with a dynamic budget stereo amp, or use them as an upgrade on an all-in-one compact hi-fi system. It'll be interesting to see how Wharfedale can top with these with the forthcoming Diamond 11 Series. Satisfyingly cheap, this Q Acoustics twin set could be an inspired choice for canny budget system builders. Available in Walnut and Graphite finishes for just £130, or with a fifty quid premium for Gloss White or Black, these medium-sized standmounts look more stylish than you might image, thanks to a curvy cabinet design and flush-mounted drive units. The 2020is sport a newly designed 25mm soft dome tweeter, decoupled from the speaker baffle to mitigate against any vibration from the long throw bass woofer. This arrangement emphasizes detail and clarity, while the rear-ported design allows the speaker to drop deep. It’s this improved bass response which separates the 2020is from the even cheaper 2010i. The model also benefits from a carbon fibre and ceramic coated paper mix for its cones. Key attributes include a low distortion, fast transient response and wide soundstage. I reckon these are my favourite budget buys right now. If you want a big bang for your buck, then Monitor Audio’s Bronze line-up is a good bet. Benefiting from trickle down tech from the brand’s pricier Silver and Gold speakers, the brand’s B2 bookshelf model is a great mid-range choice. The cabinet is constructed from rigid 18mm MDF, enthusiastically braced to reduce resonance. A high frequency 25mm C-CAM Gold Dome tweeter and 6.5-inch C-CAM dished cone bass driver, sit above a front-firing HiVe II port. You won’t need to locate this by a wall to bolster bass. Construction quality is excellent. Driver fixings are invisible, while magnetic grilles add extra polish to the design. You can choose from White Ash, Black Oak, Walnut or Rosemah vinyl wraps. You’re unlikely outgrow these any time soon. With their distinctive yellow Kevlar cones, these Bowers & Wilkins bookshelves are self evidently a cut above budget rank and filers. But if you’re looking for speakers with the chops to partner some meaningful Hi-Fi separates, then they’re an essential audition. The speakers feature a decoupled 25mm aluminium dome tweeter, reinforced for improved high frequency reproduction, partnered with a 16.5cm Kevlar mid bass driver. Unusually, the tweeter itself sits in a ring of gel, to keep it isolated from any cabinet vibrations. The cabinet design could charitably be described as classic; there are no aesthetic surprises here. But you won’t be buying these speakers to match the decor. B&W speakers specialise in scale and impact, and that’s what you get here; the 685 S2 find musicality where lesser speakers just find mush. Whatever your choice of genre, they’ll work. In the largely uniform world of bookshelf speakers, the Kef R300’s are borderline Brobdingnagian. But if you can accommodate their studio monitor bulk (to be honest, they’ll not fit too many shelving units), you’ll be rewarded with a suitably high end performance. I love the entire R Series range, to be honest, so it’s no surprise that these standmounts are my top recommendation when money is no object. Key to their musicality is KEF’s characteristic Uni-Q driver, which features a 25mm aluminium-dome tweeter centralized within a 12.5cm magnesium alloy midrange driver, giving perfectly time-aligned audio. Sitting beneath is a 16.5mm aluminium woofer, able to handle copious bass. If your predilection is classical or jazz, we think you’ll be well served. Available in Walnut, Rosewood, Gloss White and Piano Black, these three way speakers are best served with a bottle of Chianti at cool room temperature and some fine Swiss cheese.